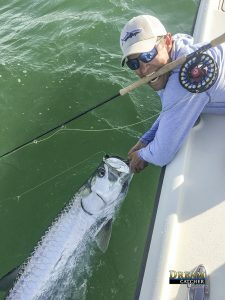 May 1st 2018 – Get your game on folks its tarpon fishing season. Windy conditions prevail across most of the Florida Keys and Key West as everyone gets ramped up to find the Silver King along the beaches, on the flats, in the shallows and rolling through the ditches as they make their way up the State of Florida. The May full moon is behind us so the tough days of getting a bite on a nice tarpon should be behind us more and more as each sliver of the moon comes. Fly Fishing For Tarpon in Key West. The Migration has begun and the fish are hungry. Here in Key West at Dream Catcher Charters our captains are hard at it fishing two trips a day and being in the right spots for the action for out clients. The weather this week has turned to be a little windier than it has been. Opening up this first week in May we have 25mph winds out of the East. A typical pattern for March but not a typical May as the late Easterlies have established themselves right along our islands. No big deal as the tarpon are all inshore and ready to eat even in the wind. The higher winds make it tough on our fly fishermen that are not the strongest casters a solid double haul will make or break the windy day. Its also harder to see the tarpon as the wind has a tendency to whip up a bit of froth on the surface making it harder to see the fish before they see you. A nice white bottom spot is a good place to be when targeting tarpon fly fishing on a windy May Day. Our bait fishermen will be very happy. Tarpon love to eat in the wind. Here at Dream Catchers we use state of the art bay boats solidly built by Yellowfin Yachts powered by the latest in technology from Mercury Marine to get our anglers to and from the fish in comfort, ease and agility. Being on the bay boats we have the advantage of using a forward mounted electric trolling motor to keep us on the fish and our anglers in the strike zone. There really isn’t a better boat for doing what we do, tarpon fishing. Many think that May is the end all for tarpon fishing season here in Key West. Me, I think May. June, July August and into September are all great months to catch tarpon out of Key West. Certainly the summer months are better to avoid the crowds. I much prefer tarpon fishing in June after all the visitors and part time fishing guides leave. the later in the summer you go tarpon fishing the better chance you have at our Key West flats fishing grand slam where we try for Tarpon, Permit and bonefish all in the same day. Planning a tarpon fishing charter in Key West is super easy.